To correct a horse that pulls after jumping a fence, you need to practice downward transitions to the halt after jumping each fence, until the horse learns to anticipate collection after the jump. This type of work–pulling the horse up after every fence in schooling–may seem tedious, but is very beneficial in training your horse to have an automatic response of collecting after the fence. You may need the pulley rein the first time or two in order to pull up within four or five strides of the fence. The horse should catch on to your routine and begin to anticipate the command to halt. Any slowing of pace or softening of the horse’s mouth should be rewarded with a lighter feel of the reins. Remember, horses only know they’ve performed correctly if the rider shows a clear differentiation between right and wrong by a softening of the aids when the horse gives the proper response. Bending is directing the horse through the use of your hands and legs into a position in which the animal’s body is curved to the left or right from head to tail. To position the horse in a bend, use the following aids: your hand toward the inside of the curve moves to a point just over and slightly in front of the withers; simultaneously, the outside hand moves away from the horse and forward to allow the animal to bend its neck, with the release of pressure being equal to the amount of pressure added by the inside hand; your leg toward the inside of the bend is positioned at the girth; and the outside leg is positioned behind the girth. 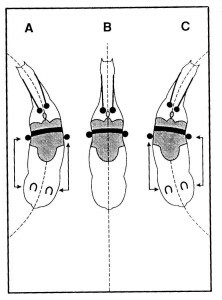 The diagram below shows the placement of the rider’s aids for bending to the left (A), keeping the horse straight (B), and bending to the right (C). Notice that the rider’s leg affects the placement of the horse’s hind leg on the same side. 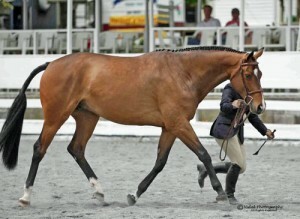 The basic purpose of bending is to allow the horse to stay balanced on curves. Instead of letting the animal drift toward the rail or cut into the center of the ring on turns, both of which are common errors, you must use your aids to keep its weight distributed equally on both sides of its body. Bending requires the horse to yield with its inside hind leg, so that the inside hind foot is placed laterally farther underneath the animal’s body on a curve than when the horse is traveling on a straight line. Consequently, bending exercises can be useful in breaking up resistances in the haunches, for the movements require the horse to submit with its inside hind leg, blocking it from rigidly resisting with that leg. A horse may resist your inside leg, as you attempt to push its body into a bent position, and press its rib cage back against you. This is where tact comes in. The worst thing you can do is wallop the horse in the side with your heel, for the animal is responding naturally to pressure against its side. It is the horse’s way of saying, “Hey, don’t push me around.” Instead of reacting by adding more force with your leg, try easing off the rein on the opposing side, moving your hand forward and outward in a leading-rein position. This gives the horse a sense of direction, an “open door” through which it can travel. If you are an inexperienced rider, it will be easiest for you to learn how to bend your horse if you practice placing your aids correctly at the halt, then apply them at the walk in each direction, before you attempt bending at faster gaits. The principle of restricting pace when practicing new techniques holds true in most exercises for the horse or rider. The reason is that the greater the pace, the more the rider is at a disadvantage, since the horse can go farther astray in a shorter time, causing its mistakes to be exaggerated and the rider to become frustrated.